In the present day primary steelmaking processes, magnesia carbon bricks are the most commonly used refractory material for lining of the primary steel making furnace. 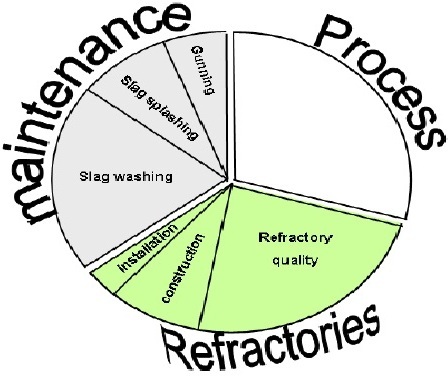 The lining life differs from steel plant to steel plant because of refractory, operation and maintenance practices (Fig. 1). The relationship of some of the parameters influencing the lining life of the converter is shown in Figure 2. During the process of steel making, the main wear mechanisms are impact, corrosion, thermo-mechanical stresses and erosion. Though all the factors are important but corrosion due to dissolution of refractory material in the slag has a major effect on the lining life. During the process of steel making various oxides are produced which are fluxed with calcined lime to produce steel making slag. This slag is corrosive in nature and is in continuous touch with the surface of the converter lining. Due to this reason dissolution of lining takes place when the conditions are favourable to it. The temperature in the converter, while producing steel, rises because of exothermic reactions that are taking place. The tapping temperature of liquid steel is normally 1660 deg. C and above. At these temperatures the steel making slags, if it is unsaturated with MgO, take MgO from the converter lining material and try to get saturated. In the process it depletes lining from MgO and causes faster wear of the lining. For arresting this, it is necessary that the steel making slag is made saturated or super saturated with MgO by adding materials in the converter during the process of steel making, which are rich in MgO. The most common materials containing good per cent of MgO are calcined dolomite and calcined magnesite. The MgO containing materials which are charged in the converter are to be highly reactive and not to be dead burnt so that they dissolve in the slag quickly and prevent dissolution of the lining material for making up of MgO in the converter slag. 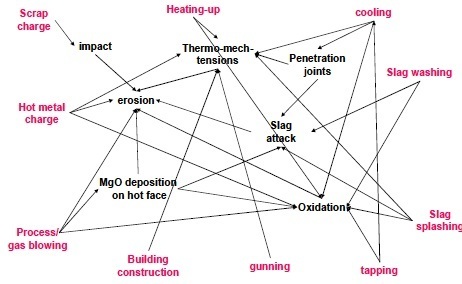 The quantity of MgO containing materials to be charged depends on the tapping temperature. Higher the temperature higher the per cent of MgO is needed to make the slag saturated. At 1660–1680 deg. C tapping temperature it is better if the MgO in the steel making slag is kept above 10 per cent. The addition of calcined dolomite in the converter has other advantages also since it reduces the consumption of calcined lime during steel making. Further 10% to 12% MgO in the slag do not have any appreciable effect on slag viscosity. However increase in slag viscosity, if there, can be controlled by using slag thinning agents. The only feared adverse affect of high MgO slag on steel making is poor phosphor removal during the steel making. The practice is very effectively utilized in many Indian steel plants where hot metal phosphorus levels are not high. The positive effect of high slag MgO on the lining life has been experienced in these steel plants. Now it has become a normal practise in these plants to keep MgO in the steel making slag at a level above 10%.